Be a Mogul. Dine at at Moguls. For those days – or nights – when you just don’t feel like trekking out for lunch or dinner, we have a solution for you. 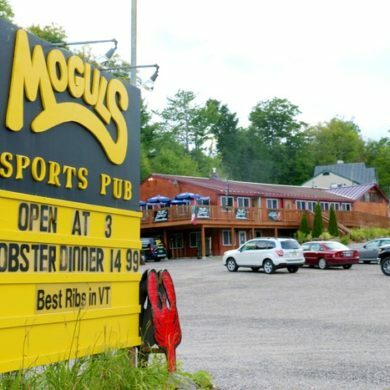 Moguls Sports Pub is located directly across the street from Killington Mountain Lodge. Consistently voted the ‘Best Ribs and Burgers’ in Killington, that’s what we ordered. And they delivered. The ribs are award-winning. The wings are called ‘Hurt Me Bad.’ Both feature Jack Daniel’s in their savory sauces. The food is good old American pub fare – good bread, good cheese, good meat. You got it. Think wings, sandwiches, chicken fingers and pizza … with some extras in the mix, like Greek gyros and platters, and even a traditional lobster dinner. The kid’s menu features miniature versions of the regular fare, and includes several pasta options. There’s a game room for kids downstairs with video games, skee ball, air hockey and more. Win a game, get some tickets – and redeem them for prizes before you leave. Upstairs in the bar area, you’ll find entertainment for grown-ups. So mom and dad can play here while the kids play below. They have pool tables, a small stage, darts and other games. 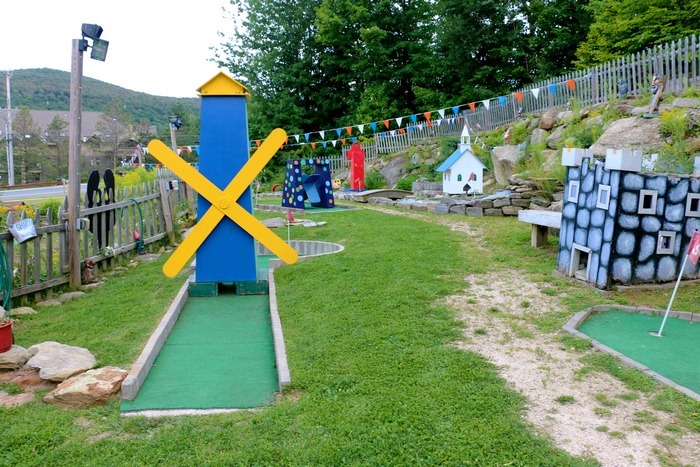 Head outside for mini-golf and horseshoes, picnic tables and yet another stage for live music on Sundays during the season. The bar is full, with a great local beer selection. Drinks are big and strong, like the men you might meet here. There are several TVs to catch whatever game you might be keen on viewing. Moguls serves late night food (until 2 a.m.) Friday and Saturday, so it could be a nice place to end a big pub crawl. Because you can seriously walk across the street to bed. Check for special events like April’s Annual Pig Roast. 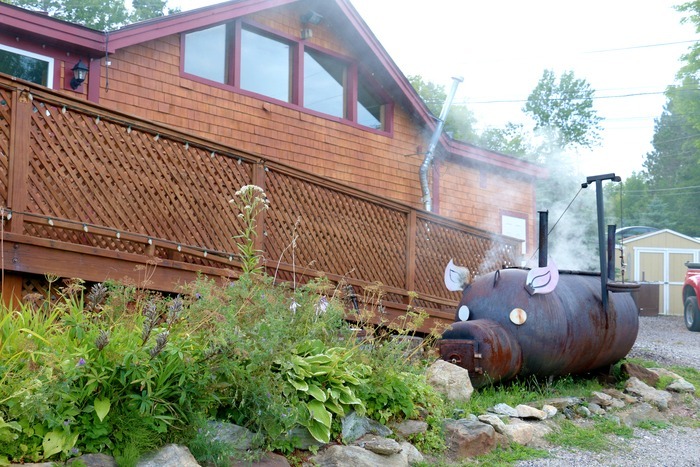 The giant smoker in the front of the restaurant is modeled to look like a pig. If you’re not careful, you may feel like a pig when you walk out of this place. But hey, you’re on vacation. And your home-away-from-home? It’s right across the street. Moguls is located at 2630 Killington Road in Killington VT. For more information, please visit the Moguls website or call (802) 422-4777.